I participated in the Inca Trail Marathon in June 2015. This was my first trip with Devy and Andes Adventures. What a fantastic trip and adventure. This was not just a marathon trip. We got to see many parts of Peru and the Peruvian people. But for me as probably most participants, we came for the Inca Trail Marathon and Machu Picchu; therefore my post is going to be about the marathon. 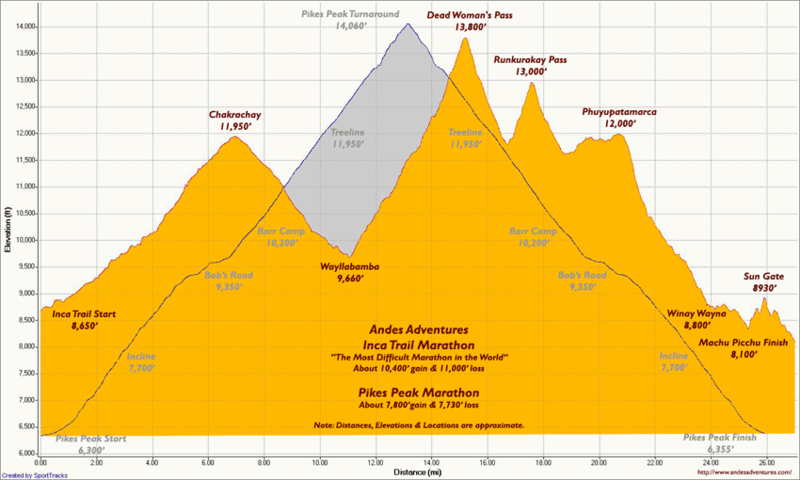 Andes Adventures bills this race as the hardest marathon in the world. Since the Pikes Peak Marathon is considered the second hardest and I have run it six times, I was anxious to compare difficulty. The Inca Trail Marathon includes basically four major climbs with the longest being 4,200 feet toping at 13,800 feet. It is a rewarding and beautiful finish at Machu Picchu. While you can run several parts of the marathon, other parts including the two high altitude passes are power hikes at best. The Inca’s did not believe in switchbacks but steps and rocks. Therefore, this race includes literally thousands of steps up and down although they are very stable and well-built from several hundred years ago. For about the final two thirds of the race you will encounter many porters and hikers who are hiking the trail over 3-4 days. This was a fun exchange of comments and well wishing. Weather for our race was good which it usually is this time of the year. Also adding to the difficulty was we had to hike 6.2 miles the day before to our campsite, get up at 2:00 am and after getting ready, hike approximately .75 miles to the start line up about 500 feet for a 4:00 am start. This did add to the difficulty but it enhanced the overall experience of the race. With regards to relative difficulty to Pikes Peak, I would agree with Andes Adventures, this marathon is much harder due to the overall average higher altitude and surface, i.e. the thousands of steps and rocks. Therefore, based on my experience, if you are good at running up and down stairs and rocks, your time would be about 30% more than Pikes Peak and 50% more if not. My time was 9 hours, 32 minutes which was essentially a tie for 2nd place. Yes, 9.5 hours was second place. We had all age groups and nationalities in the marathon. I was one of the older ones at 57. Bottom line is this is a first class tour and an interesting and rewarding marathon. Devy and Andes Adventures took care of us in a first class manner. Thank you.